The Edsel has not been treated fairly since the brand was eliminated from Ford’s lineup after the 1960 model year. The cars are great. They all have great style, as each model year (1958, 1959, and 1960) all had unique styling that has only gotten better with age. The 1958’s were pretty different from everything else (I love it and almost bought one last week on Bring-a-Trailer but chickened out at the last minute). By 1960 the styling was toned down dramatically to what you see here – which more or less resembles a Buick Electra 225 of the same vintage. 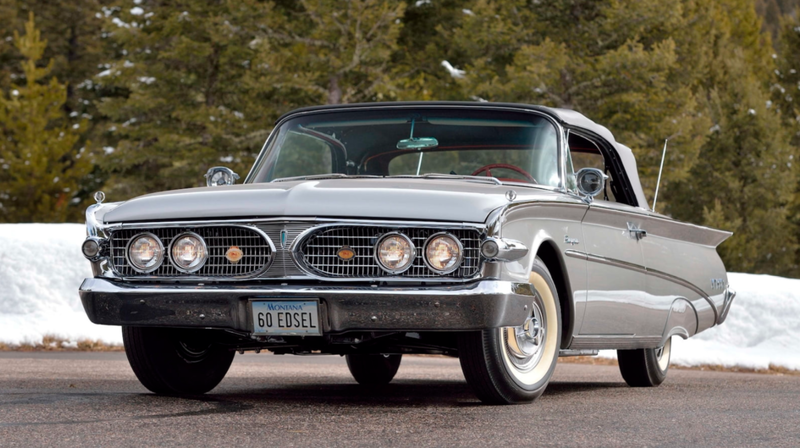 The Edsel offerings for 1960 were slim. There was the Ranger (four-door, two-door, or convertible) and the Villager (wagon). When a company starts trimming its lineup to that degree, it’s a solid sign they’re on their way out. The 1960 cars were introduced on October 15, 1959, and the brand was discontinued that November 19th. That makes 1960 Edsels very rare and only 76 examples of the Ranger Convertible made it out the door. But it isn’t the rarest: both the 2-door Ranger Deluxe Hardtop and the nine-passenger variant of the Villager are harder to find. A Ranger Convertible cost $3,000 from the factory and this car was one of the last products produced by the marque, rolling off the assembly line on the last day of production. It’s well-equipped and is powered by the optional 300 horsepower, 5.8-liter “Super Express” V-8 (a $58 option in the fall of 1959). It’s a show winner and should bring between $85,000-$125,000. Click here for more info and here for more from Mecum in Indy. This entry was posted in Uncategorized and tagged 1960, auctions, cars, classic cars, convertible, edsel, mecum, ranger by classiccarweekly. Bookmark the permalink.